slimetrail, but it doesn't seem to be quite the same and only appears in ZDoom (Not PrBoom+). It's like a vertical line that takes a triangular chunk out of the middle texture of one of the foreground stars linedefs. Maybe an issue with my Nvidia drivers or something. The other thing I'm wondering is if there is a better way to do all this while keeping boom compatibility, like a way to trick the engine into wrapping the middle texture from floor to ceiling? I know ZDoom has this as a basic feature, but alas I am stubborn. I know this is all quite complicated. Maybe I should just upload the map here if someone can instruct me how to. Thanks in advance. Update: Added the wad file as an attachment. Great to see you experiment with advanced mapping, Jeff. 1. Start with a 256*128 black canvas. 2. Insert large white stars to represent the foreground. 3. Copy that image to another 256*128 canvas, but shift the stars to the left. 4. Create as many more of these canvases with stars shifted to the left as you need. 5. Open your first starfield texture, and insert small white stars in the background. 6. Repeat Steps 3 & 4, BUT SHIFT THE STARS MUCH MORE SLOWLY. This will give the illusion of the distant stars scrolling more slowly than nearby stars. Hey, I'm back. Thank you Rex for the idea! I take it you mean for the starfield texture to be animated? I really like that idea, and I'm definitely going to go with it. It beats trying to stack middle textures of double sided linedefs. The only thing that remains is this strange bug I've encountered: As mentioned it only appears in ZDoom 2.7.1 (Though I haven't tried other versions of ZDoom), not PrBoom+ 2.5.1.3 or 2.5.1.4 Test. Also, the texture glitching only seems to happen with middle textures that are mostly cyan (the foreground stars in this case), and that have a similar angle to the 1 sided linedef behind them. Additionally this only happens to the left side of the starfield. I know pretty much for sure that for the glitch to occur the texture must be mostly transparent cyan because I've tried other textures both with and without cyan and either custom or Doom II stock textures. It only happens with the foreground star texture. I would be posting this in the ZDoom.org bugs forum, but I don't have an account there. Can someone please confirm whether I am doing something with the texture that's causing this or if this is a ZDoom specific bug? Some additional info: I'm using palleted PNG images with a compression factor of 9. 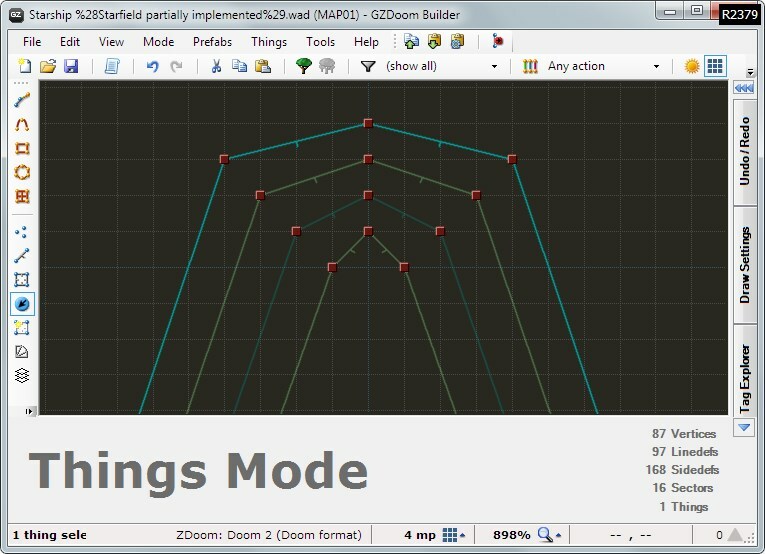 Doom Builder 2 latest version for mapping, and Slade 3 to import/convert the textures. My video card driver is Nvidia GeForce version 353.62. Attached is another screenshot from a different build of the map showing the glitch. Again, sorry I'm posting this in the wrong place. Many thanks in advance. I didn't save this build, but if needed I can reproduce the effect in a different map. I take it you mean for the starfield texture to be animated? 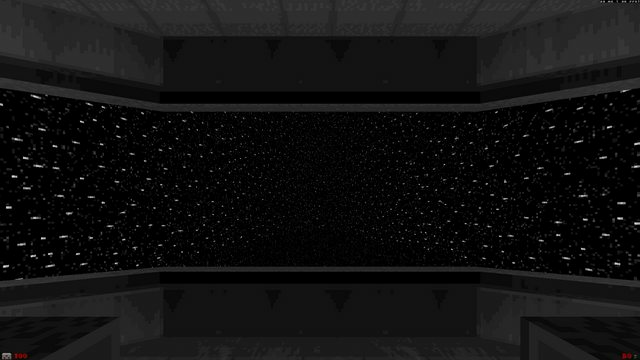 Yes, animate the starfield texture. As for your texture glitching problem, unfortunately I have never had to deal with such a problem, so I can't be of any help. However, if you use an animated & scrolling texture on a one-sided linedef, you'll get rid of the translucent 2-sided linedef in the front on which you relied for the illusion of stars moving with variable speeds. Upon re-reading your second post, it occurred to me that your problem might be caused either by using a translucent texture or by using stacked 2-sided linedefs. Have you considered creating a very tall translucent texture (i.e., use a 128 x 128 patch, but use the TEXTURE lump to make a 128 x 2048 texture). If the glitch is being caused by stacking linedefs this may take care of the problem. Davitch wrote: Could someone reading this with a ZDoom forums account and the time to spare please report this issue on there and link to this thread? The higher the resolution, the more noticeable the effect at the top. In any resolution, I could not see a slimetrail.